I happened to be cleaning up, going through some old stuff and sorting my new stuff this past week when I found myself just sitting there staring at the bag of basing sand in my hands. I wondered what made it the best and what is it about FTW that makes it what it is. And then I got into thinking about the upcoming new year. That's how it (the sand) was sold to me. The Best Basing Sand Ever. To be quite honest, looks like regular sand to me. So I emailed the person who sent it to me and they proceeded to tell me all it's finer qualities. It even works with white glue. I was sold. Works with white glue? This stuff must be the best! But there's more than one basing sand out there, just like blogs. There are hundreds of different basing sands out there. But what is it about the one you use or the blog you have that makes it what it is? That makes it stand out from the rest of the very same thing out there? I had some long winded, two part post on the past year and all my big plans for the upcoming year and then I thought, who's gonna read all that? Would I just be rambling on and on because it's the end of the year and I feel obligated to post something like that? You guys were here, you've made the journey with me. What I do need to do is say Thank You to everyone. All you readers, lurkers, contributors, commenters, everyone out there for all that you've done. Without you guys, FTW would not be what is is today. Thank you for a great year and here's to the next one. Its been a pleasure. Here's to 2011! 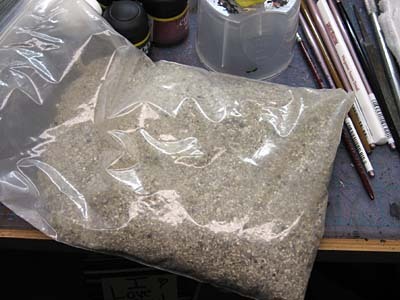 I don't know what makes the best basing sand but I do know that once you find it nothing else will do and, you hope, it will always be in stock. Thanks Ron. I may be new to the fold but I'm excited about what the new year will bring to my blog. I look forward to collaborating with you guys. I can only repeat the thanks. Thanks for the great job you do, and long may it continue. All the best for 2011! Here's to another year of amazing posts on FTW. Happy new year, sir. Happy New Year to you, Ron! And to all fellow bloggers out there. Wish you all the best for 2011. Happy New Year everyone and again, THANK YOU ALL. This year, I've got lots of cool projects to start it off... Blood Angels, Adeptus Custodes, Black Templars, more Raven Guard, some custom sculpting work.... there's tons of stuff coming. As far as I am concerned, the best sand should be irregular, realistic to the scale of the model, simple to use, inexpensive, plentiful,and most importantly, should look believable when the model is finished. A good blog I think is harder to define. I like blogs that I can relate to, either with subject matter or the personality of the blogger, also I like blogs that impress me with the work I see, new ideas and ways to look at things. A good blog should also have consistent subject matter to keep you coming back for more. THIS is the best basing sand ever. It's MOLDable. Dunes, hills, pits, whatever you want. It's pre-glued, and you can even add color.